The name Coal Measures was proposed by Farey in 1807 and 1811. term Carboniferous - coal bearing - was proposed by the English geologist William Conybeare and William Phillips in a paper published in 1822 to designate coal-bearing strata in north-central England. Conybeare and Phillips's Medial or Carboniferous Order included the Mountain or Carboniferous Limestone, Millstone Grit, and Coal Measures as it's three divisions. It was the first geological period to be established.. Subsequently in Continental Europe and Britain the system was divided into a Lower and an Upper Carboniferous. Meanwhile the American geologistAlexander Winchell proposed the name Mississippian in 1869 for Lower Carboniferous strata along the Mississippi River drainage region, and later, in 1891 Henry S. Williams suggested Pennsylvanian for the Upper Carboniferous. The terms Mississippian and Pennsylvanian Periods were then used by American geologists and palaeontologists instead of the one Carboniferous Period. Some recent fiddling with stratigraphic boundaries has allowed the American system to be matched with the Lower/early and Upper/later Carboniferous, giving a single international standard for the period. ATW041219. Map public domain. No rights reserved. An enormous, 2400 x 1200 pixel, unlabelled version of this map is available (free) in all the usual formats, including a Photoshop® *.psd file with each topographical type on a different layer. That one is 13 MB, so you'd best have a fast connection. Email augwhite@sbcglobal.net. During the late Early Carboniferous, East Gondwanaland, for the first time since Early Paleozoic, began to drift toward the South Pole. By early Late Carboniferous, the South American-North African margin of Gondwanaland had collided with the northern Devonian supercontinent of Euramerica becomes Laurasia by the late Carboniferous. There is regional subsidence of the East-European Platform (east Laurussia/Euramerica) due to compressional stresses at the platform's margins. The northward drifting Gondwanaland then collides with Laurasia, resulting in a fold belt and mountain building from Poland through central Europe to the Appalachians. Through the collision of these two supercontinents arises Pangaea. 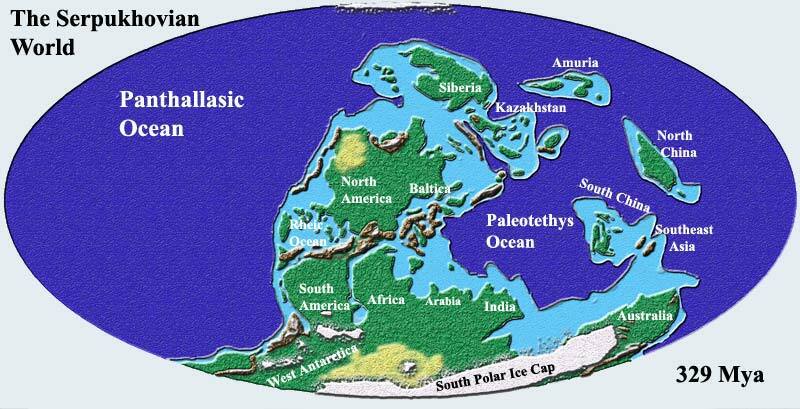 At this time Pangaea was shaped like a huge "pack man", with a huge mouth facing eastward across the equator. The large open mouth becomes the Tethys Ocean. While East Gondwanaland drifted toward the South Pole, most of the East and Southeast Asian terranes were left in equatorial positions, forming a chain of continental terranes at the eastern edge of the Tethys Ocean. Euramerica tropical and dominated by huge forests - the "coal swamp" biome. Dramatic evolutionary radiation of insects; flight appears (flying insects). The giant arthropleurids appear. Tetrapods flourish, with primitive forms co-existing alongside more advanced ones. Terrestrial arthropods very common and diverse. Many types of tetrapods. Reptiles present but small and insignificant. The early part of the period is mostly warm, but there is a pronounced cooling and glaciation during the second half, triggered by Gondwanaland's southward migration. Although the equatorial regions remain warm and wet and tropical, the poles are gripped in a massive ice age, one that lasts for many millions of years. Vast sheets of ice cover Gondwanaland. Among fish, the armoured placoderm and ostracoderm and marine lobe-finned fish (apart from the odd coelacanths) that so dominated the Devonian seas are all gone, to be replaced by an amazing diversity of sharks (Chondrichthyes). On land, especially in the Euramerican part of Pangea, the equatorial regions are covered by forests. The moist tropical climate produces a lush plant growth, which eventually becomes the great Coal Deposits (hence the name Carboniferous - "coal bearing"). The fern-like but seed-bearing pteridosperms, the huge green-stemmed Lepidodendrale lycopods (Lepidodendron, Sigillaria, etc, 35 meters tall), the giant sphenopsid Calamites (20 meters in height), and the strap-leaved mangrove-rooted Cordaitales (Cordaites, up to 45 meters) are all abundant, and tied closely to water. The drier uplands were much more sparsely covered. Meanwhile, Gondwanaland, with its colder Antarctic climate, has its own very distinct flora, dominated by glossopterid pteridosperms. Inhabiting the great forests were many types of insects, spiders, and other types of arthropods evolve. Encouraged by the oxygen-rich atmosphere, the abundance of food in the decaying forest leaf-litter, and the absence of large terrestrial vertebrates, many reach huge sizes. The dragonfly-like Meganeura, an aerial predator, had a wingspan of 60 to 75 cm. The inoffensive stocky-bodied and armoured millipede-like Arthropleura was 1.8 meters long, and the semi-terrestrial Hibbertopterid eurypterids were perhaps as large, while some scorpions reached 50 or 70cm. Alongside these giants were more conventionally sized invertebrates. In the water and water margins the tetrapods flourish, are the dominant life form, and many different types inhabit the rivers, ponds, and swamps of the Carboniferous tropics, including many crocodile, eel, and salamander-like forms. But the largest hunters of the time were the gigantic rhizodont fish, reaching 7 meters in length. 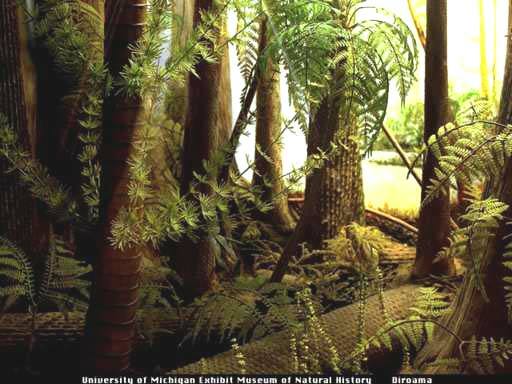 Meanwhile, the first reptiles appear, adapted to life lived totally on land, but remain insignificant until at least the very end of the Carboniferous.